This line of code tells the compiler to reserve a space in the memory location, store an int value in it i.e. 10 and name this space in the memory location, a. This memory location where the int value i.e. 10 is stored is also referred to as a memory address. Let's suppose this memory address is 2686776(computer automatically finds an empty memory address where values are to be stored). Look at the diagram below for reference. Pointers allows us to access the original value stored at that particular address. We could pass this address to a function that takes pointer argument and allow it to make permanent changes to the value at the memory address. 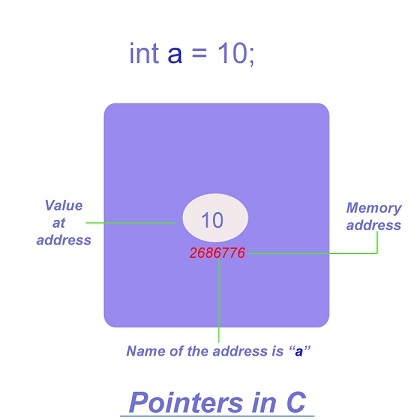 & "address of" operator, which gives us the memory address of a value. * "value at address" operator, which gives us the value at an address. In the upcoming code example, we are going to create a pointer variable which points to a memory address, containing an int value 10. We have declared a pointer variable, b which is pointing to address of int variable a. We have successfully accessed the address of int variable a using & "address of" operator i.e. &a. The memory address is printed using %u format specifier. Next, have accessed the int value(10) stored in a by using * "value at address" operator with pointer variable, b i.e. *b. Finally, we have printed the address pointed the pointer variable, b. In the upcoming example, we are going to create a function named subtract10 which subtracts 10 from value of the variable of int type passed to it using pointers, when this function is called. The prototype of this function is declared with a void return type, because this method will not return any value when it is called. This function will be passed the address of an int value when it is called. Hence we have specified a pointer that points to a value of int type i.e. int *, within the parenthesis(). Calling the function - We have called the subtract10 method by passing the address of value of an int variable named a as an argument, by using the "address of" operator i.e. &. The int variable a has a value 10 and its address is referred as an "actual argument" of the function subtract10, when it is called. Function definition - When the subtract10 function is called, it receives the address of the variable(a) passed to it and this address is copied into pointer variable named i, which is used to store the address of an int variable, declared in the definition of subtract10 function. In the function definition, the pointer variable i can also be referred as a "formal argument" of subtract10 function. This function, uses the * operator which stands for "value at address", which when used with a pointer variable i.e. i, allows us to access the value at an address in the memory location, pointed by i variable. Eventually, the subtract10 function subtracts 10 from the value contained in i, which is reflected when the value of variable a is printed again on the console after calling the subtract10 function. In the upcoming example, we are going to create a function named swap_int which accepts two int arguments and successfully swaps the value contained in these two char variables passed to it, because we have called the function and have passed it arguments by reference using pointers. Let's see the code.